We provide delivery, setup and will stay onsite to operate the equipment. Sound system rentals. Handheld and lavalier microphones. Headset mics. Music-ready laptops & more. Visual Advantage only rents updated and reliable audio equipment. 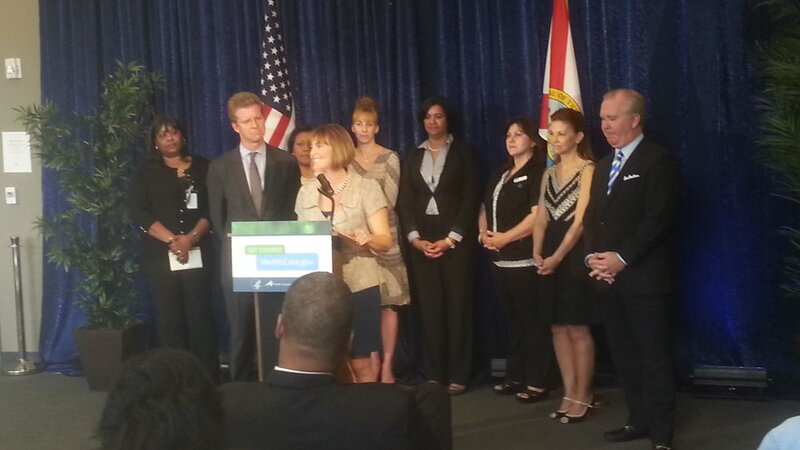 We have sound rentals for any size event, meeting or conference to the Tampa, St. Petersburg, Orlando area. We provide our clients, if requested, delivery & setup of the equipment. Our rental options give us the flexibility to meet any challenge your event might present. 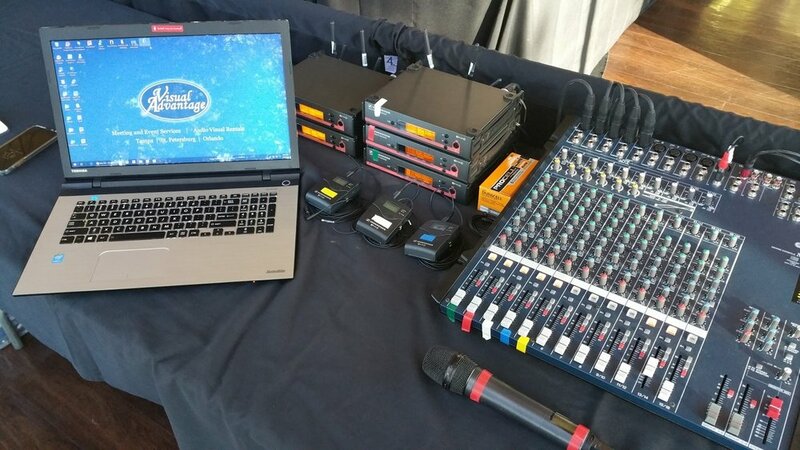 For large or important events or if you do not feel comfortable handling AV equipment, we can provide a technician(s) to stay onsite during your event. Our professional & friendly techs take care of all the details required to ensure your event runs smooth & without issues. Not sure which speakers or how many speakers you need? Give us a call, text or email & we will be glad to point you in the right direction. We will ask the right questions so we can provide you with the correct sound system for your event. Our speaker rentals always look new, professional & more importantly, sound great! Are you needing your audience, guests or attendees to hear what is being said? Our audio microphone rentals are extremely reliable & easy to use. Our wireless handheld microphones, headset mics & lavalier or lapel microphone rentals give you the flexibility needed to meet your audio demands. Our laptops are ready to go with plenty of music to choose from. We have preset playlists created for a cocktail hour, an elegant dinner, end of the night drinking and much more. Contact us with questions or suggestions. Not sure what an audio board is or does? Audio boards are the "go-between" to your device inputs (microphones, laptop, phone or any other player) and the speakers. The size of the audio board you need depends on how many devices you have going in (input). Please feel free to call or email us if you have any questions. An audio press box and/or mult box has multiple outputs of a single audio source. They are mainly used for press events or press conferences where media outlets need to get a "clean" feed from a person speaking into a microphone. 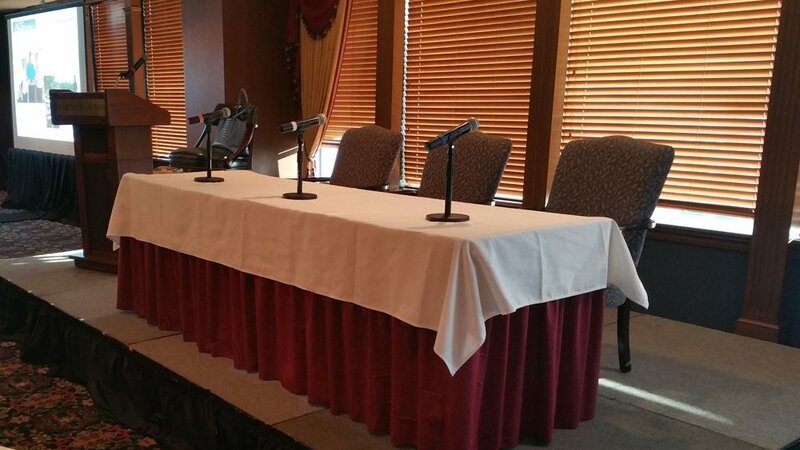 If you have a media event where a microphone & speakers are used with media attending, a press box should be used. Visual Advantage provided 5 star service for my corporate event. Professional, responsive, flexible, reliable and fair prices are what you can expect here. Sound Systems and Microphones for any Event. We provide professional-grade microphone rentals & high-quality sound systems so your presenter, keynote speaker, moderator or panel group can be heard by everyone. If you or the presenter(s) has a preference, we carry wireless microphone rentals - handheld microphones, lavalier or lapel mics & head set mic rentals. We have the equipment & knowledge for more demanding setups, such as a panel discussions with moderator, panelists & audience participation. Please look around on this page or feel free to contact us to see if we can help out with your upcoming meeting or event. Need More Than Sound for Your Event? We carry a full line of audio visual rentals and the required support, giving you a worry-free event. If you need additional AV equipment such as projector rentals, hd tv rentals, pipe & drape, podiums, production equipment, up lighting rentals and more we can help you out! Visual Advantage has been providing reliable, low-cost av equipment and support to the Tampa, St. Petersburg, Orlando area since 2001. We have an outstanding reputation for giving our customers the correct audio visual equipment rentals needed, ensuring your message is seen & heard by you and your guests. If you have any questions, want pricing, or just want to see how we can help you with your event, please don't hesitate to contact us. Or continue to look around our site to get a better understanding of what we’re about and how we can help.